Rootworms are the larvae of beetles. They fall into two groups: clover rootworms and northern corn rootworms. The former species is found throughout the U.S. and southern Canada. The adult is light brown, oval, and 1/5" long. It lays its eggs at the base of a variety of host plants, including apple, beans, corn, grape, melon, potato, and strawberries. The whitish, plump larvae then burrow into the roots and chew the smaller ones. Adult beetles can cause minor damage to hosts by chewing long, curved or zigzag marks in leaves. Clover rootworms can be controlled by thorough fall cultivation, which should effectively destroy overwintering larvae. Northern corn rootworms are found primarily in the north central United States, where crops of its favored hosts (corn and grain) are abundant. The adult is bright green to yellowish green, sometimes with a brown head. It is 1/3" long and fast moving. It lays its yellow eggs on the ground near corn roots. The larvae are thin, wrinkled white worms with brown heads that can grow up to 1/2" long. They burrow into the roots of their hosts, doing considerable damage. Fortunately, the grubs can be effectively controlled with regular crop rotation. 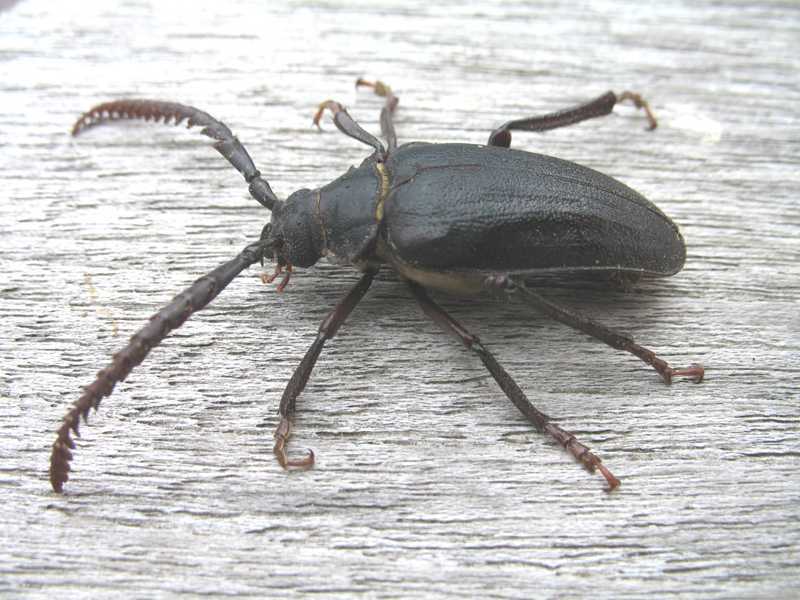 Adult, male tilehorned prionus beetle (Coleoptera). The larvae bore into roots of Malus, Carya, Prunus, Castanea, Maclura, Populus, Tilia, and Pyrus and cause dieback and death. 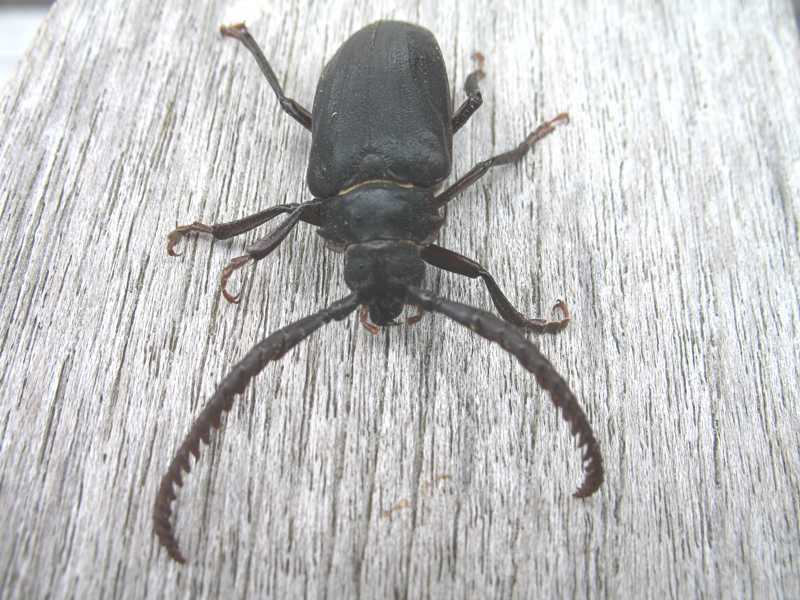 Front view of an adult, male tilehorned prionus beetle (Coleoptera). 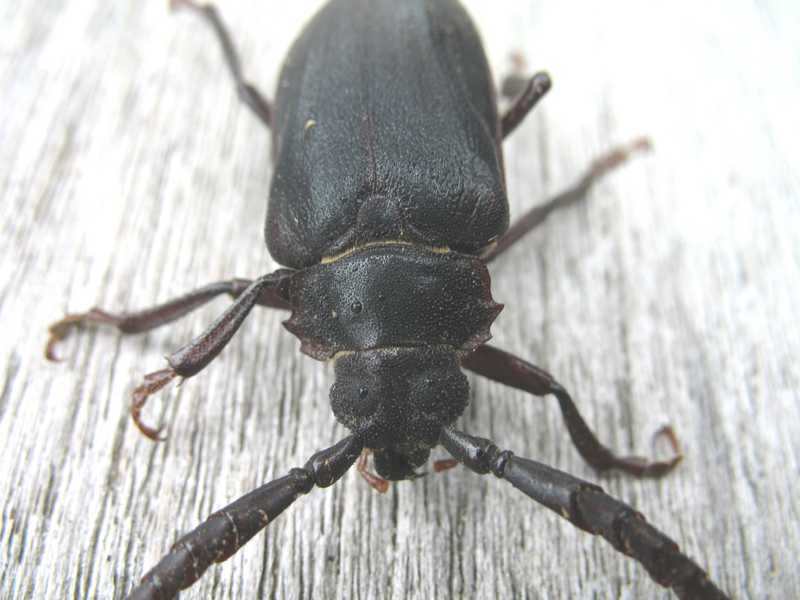 Close-up of front of an adult, male tilehorned prionus beetle (Coleoptera). Click a link in the site map below to see other "Pests and Problems" pages.